From the Star Wars collection by Hasbro. Star Wars The Force Awakens Armor Series Action Figures Wave 1 Case. From the Star Wars collection by Hasbro. Star Wars The Force Awakens Armor Series Action Figures Wave 1 Case. 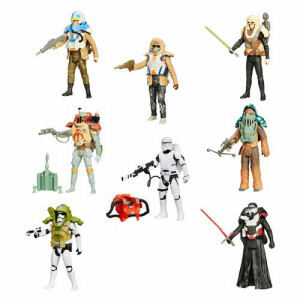 1 SW E7 FINN STARKILLER BASE - 1 SW E7 KYLO REN - 1 SW E6 LUKE SKYWALKER - 1 SW E5 BOBA FETT - 1 SW E7 CHEWBACCA - 1 SW E7 FIRST ORDER STORMTROOPER - 1 - SW E7 POE DAMERON - 1 SW E7 FIRST ORDER FLAMETROOPER Each 3.75 inch action figure includes at least two accessories.